Add warmth, style and chic to the ambience of the establishments with a beautiful range of jute flower pots. It always create pleasing and natural look to the interiors with its breath taking beauty as well as features. Jute flower pots designed from this natural fibre called jute is considered as one of the strongest and attractive home furnishing items. These jute flower pots have been highly popular if compared to the plastic, metal and wood flower pots. Jute can be easily mixed with other fibers as well that may include cotton, wool and linen that leads to the amazing variation in the design and quality of pots. The soft and silky luster of fine jute makes it perfect for designing these jute flower pots that add to the beauty of the interiors of offices, homes, hotels, restaurants, etc. It is woven very beautifully in varied patterns to match up every kind of interiors. Unmatched style can be easily reflected by eye catching designs, styles, and patterns. Varied shapes from oval, round, rectangular, square to any circular are available. 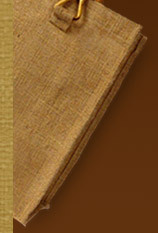 It complements the decors with a rich variety of colors from neutral tones to bleached to dyed in any attractive color. Jute is an adaptable yarn, hence flower pots made from them are easy to clean and maintain. It is highly durable that can be easily run for a longer period of time without any abrasion. Its highly resistant property of wear and tear makes it a perfect option. In addition to this, a jute flower pot can easily withstand extreme weather conditions ensuring its long life with no maintenance. It can be availed at pocket friendly prices making it a perfect choice of everyone. Above all these features, one of the greatest advantages of jute flower pot is its eco friendly as well as biodegradable nature.